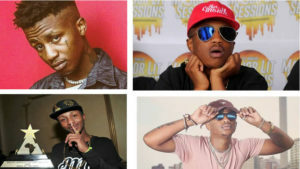 Emtee whose real name is Mthembeni Ndevu is a South African rapper who is best known for his hit single ‘Roll Up’. He was born on 15th September 1992. His debut album ‘Avery’ was certified platinum by RISA on 1st July 2016. Emtee’s real name is Mthebeni Ndevu. His long time girlfriend is Nicole Kendall Chinsamy. He says he would like to marry Nicole sooner rather than later but she wants to complete her studies and start a business before they can walk down the aisle. Nicole is still studying and she’s in her second year of studying fashion design at Sew Africa. He has a son who was born in 2015. Emtee’s debut album Avery was named after his son. He has another baby Logan who was born on 30th January 2018. 2016: Amstel Record of the year ‘Roll Up’ during the 22nd South African Music Awards. 2015: He won the Listeners Choice award during the Metro FM Music Awards. He won the Record of the year & Rap album of the year at the 22nd SAMA Awards in 2016.